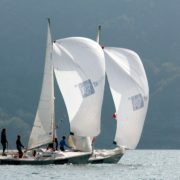 William RUGOLO (DEN) dislocated his shoulder yesterday and he was unable to sail. 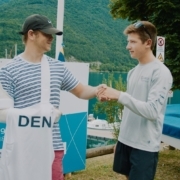 In true sportsmanship Sidney GATHRID (USA) stepped in to replace William as crewman on so that DENMARK team could continue the World Championship. William hands over the Denmark jersey to Sidney. thank you Sidney! Just finish the first day of Youth Match Racing World Championship. 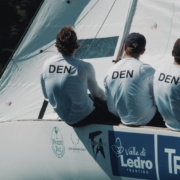 After the opening ceremony took place yesterday in the streets of the village of Ledro finishing in Piazza Mülleheim where the authorities have welcomed the twelve teams from eleven different nations, only Italy has the right to be present with two crews. Today has entered the heart of the event. On time, the Regatta Committee, chaired by Giorgio Battinelli at 10.00 am, began the procedures. Eleven flights ended, for a total of 44 matches; the Italian Ettore Botticini with Lorenzo Gennari and Simone Busonero is leading with seven victories and zero defeats, with 6 victories and 1 lose the Americans with Christopher Weis are now second and 3rd on the temporary podium the New Zealand crew of Nick Egnot-Johnson. Hoping for the wind to assist like today, tomorrow the procedures will start at 10.00.